Lineman Simote Pepa and linebacker Junior Tafuna give Utah nine February signees and 21 total. (Chris Detrick | The Salt Lake Tribune) Bingham's Simote Pepa poses for a portrait Friday, December 15, 2017. 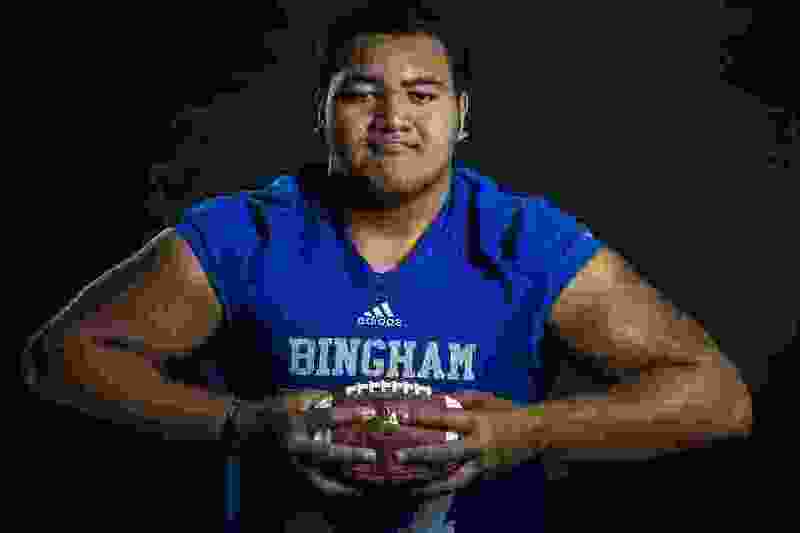 After their signing event was postponed due to this week's snowstorm, Bingham High School's Simote Pepa and Junior Tafuna signed with Utah on Thursday, becoming the eighth and ninth members of the Utes' February recruiting class. They joined California prep defensive back Sione Vaki, who signed late Wednesday night. In all, the Utes have 21 signees between the December and February letter-of-intent periods. Utah remains in play for Orem receiver Puka Nacua, whose choice of schools is expected sometime this week. The brother of Ute receiver Samson Nacua committed to USC last summer, but is believed to be considering Washington, Oregon and Utah at this stage. Darren Jones, a 6-foot-8 receiver from San Bernardino, Calif., and LaColby Tucker, a 6-8 offensive tackle from Garden City (Kan.) Community College, remained unsigned, amid questions about their academic status. Each committed to Utah a few months ago. The Utes signed Garden City lineman Bamidele Olaseni, a higher-ranked prospect than Tucker. Pepa is the No. 6-ranked player in Utah by 247 Sports and Tafuna is No. 7. Pepa posted 11 career sacks for the Miners, who won Class 6A state championships in 2016 and ’17 and lost to American Fork in overtime in last November’s semifinals. Pepa made the 2017 All-Tribune team. The 6-2, 337-pound lineman’s announcement came Thursday. Tafuna (6-2, 235), long committed to Utah, intends to serve a church mission before enrolling in 2021. Vaki (6-0, 200) has similar plans. Recruited as a defensive back, he played safety and receiver at Liberty High School in Antioch, Calif.
Six of Utah’s seniors were invited to the NFL Scouting Combine, beginning Feb. 26: linebacker Cody Barton, offensive tackle Jackson Barton, safety Marquise Blair, kicker Matt Gay, linebacker Chase Hansen and punter Mitch Wishnowsky. Utah’s Pro Day is March 28.